The knee joint is unique in that it sits out there in space between two relatively stable joints – the hip and the ankle. The hip has the pelvis and core to help stabilize it and the ankle is stabilized by the foot and ground. You cannot move the hip or ankle without it affecting the knee to some degree (this is important because hip weakness is a common source of knee pain… stay tuned). The big bone of our thigh is the femur; the big bone of the lower leg is the tibia. The knee is where these two bones meet and glide over each other. The patella (kneecap) glides in a track over the end of the femur when the knee is bending. The smaller bone on the outside of the lower leg is the fibula, it’s sometimes considered part of the knee. On the back (posterior) of the knee, our gastrocnemius (calf muscle) attaches to the femur – above the joint line. The three hamstring muscles – biceps femoris attaches to the fibula, semi membranosis & semi tendonosis attach to the tibia – below the joint line. sartorius muscle attaches on the medial side of the knee on the tibia, (push your knees together, where they hit is the medial side, where your hands are pushing is lateral). 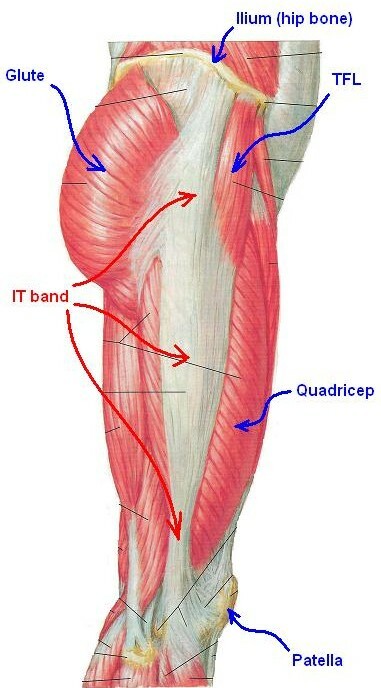 Lastly, the iliotibial band (ITB), which is really a long tendon, attaches on the lateral side of the knee on the tibia. And then there’s the medial & lateral meniscus and a whole bunch of ligaments and other structures that help reinforce the knee… like I said, quick lesson. How did your knee start hurting? That’s the first question I always ask people. This starts the dichotomy toward the proper steps of fixing the problem. With runners, the most typical answer is: “I don’t know. It started as a slight pain that I thought would go away but it has just been getting worse.” They usually continue by saying: “at first it hurt toward the end of my run, then it slowly started hurting earlier during runs, now my knee hurts the next day, stairs are painful to walk down“, etc. Believe it or not, that’s actually not difficult to fix, I’ll explain how and why soon. The not-so-easy-fix and the answer I don’t like to hear goes something like this: “I stepped, [stood up, turned, tripped, jumped, landed, fell, slipped, knelt, squatted] and felt a sharp pain, [pop, snap, strange feeling] and then it was immediately painful and swollen the next morning.” That usually indicates a more serious injury. If you had something like that happen (sudden pain that occurred with a specific movement or incident) you should head to a doctor or physical therapist right away. Clicks, pops, snaps and clunks that are painful are something to be concerned about. As is any kind of “locking” or “giving out” sensation. Getting back to the person who had the pain start slowly with no specific event (aka: insidious onset)– My next question is – Which part of your knee has the pain? The answer is usually one of these: along the outside (lateral) edge, above the kneecap, below the kneecap, behind the kneecap, along the inside (medial) edge, behind the knee. For these scenarios, the knee pain is usually being caused by something (a muscle imbalance or strain) that affects the alignment of the knee. It’s a difficult theory to accept at first but hopefully I can explain it well enough to get people going in the right direction toward fixing the problem. In my next post, I’ll start with the most common type of knee pain – lateral knee pain, often referred to as IT band syndrome. 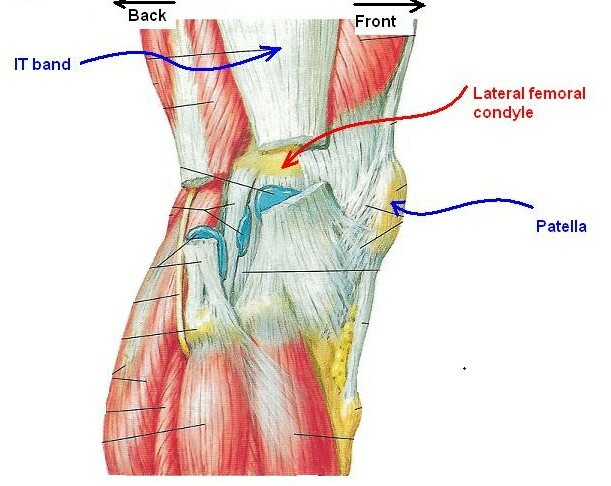 This is where the IT band passes over the lateral condyle of the femur, creating friction that eventually leads to pain. It’s very, very common in runners. Within the region of the Achilles tendon there lives another lesser known muscle and tendon that runs right in front of (anterior to) the Achilles. The photo to the right should help orient you. 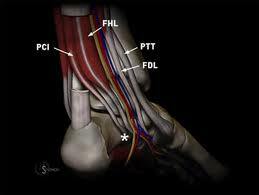 This muscle/tendon is called the Flexor Hallicus Longus (FHL). My belief is that many FHL problems are misdiagnosed as Achilles tendon issues and are in fact a problem with the FHL. After years of treating people for “Achilles Tendonitis” I began noticing a trend that many of these people shared. A lot of people also had very limited movement of their big toes (the fancy Latin medical term of the big toe is Hallux – the “H” of FHL.) 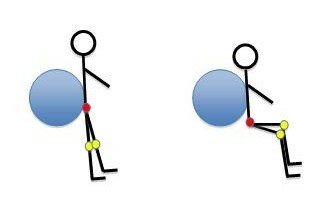 This can easily be assessed by the ability to squat down as in the picture below. If there is restriction, this motion is usually painful and, as in the first picture, the ball of the foot comes off the ground. In the second picture, the ball of the foot remains on the ground. Our big toes should be able to move 70 degrees in the upward direction. The bulk of our calves is mostly made of the two muscles that attach to the Achilles tendon – the gastrocnemius (gastroc) and the soleus. The gastroc is the muscle that we can see just under the skin which gives our calves the familiar contour. The gastroc’s job is to create the foot/ankle motion called plantar flexion, which is familiar to most people as rising up on our toes, stepping on the gas pedal and climbing stairs. The gastroc is also a big running muscle, helping us push off with each stride and if you’re a forefoot or midfoot striker, absorb the impact of landing. The soleus is just under the gastroc further aiding in the motion of plantar flexion. 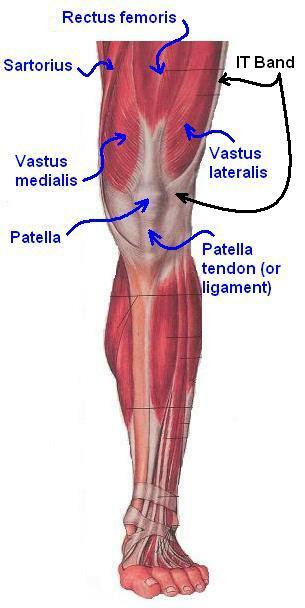 There is a third layer of muscle under the gastroc & soleus consisting of 3 muscles, which all run down into the foot. 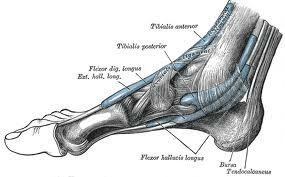 They are the flexor digitourm longus (FDL), the posterior tibialis (post tib) and the flexor hallicus longus (FHL). You can Google the first two if you want to know more about them. I’m going to focus on the FHL here. The FHL starts along the outside of your lower leg and runs all the way out to the end of your big toe along the bottom of your foot…which is on the inside of your foot. It makes its devious cross over to the other side right in front your Achilles! Why would a muscle that controls our toes start way up in our legs? For the same reason why muscles that control our fingers start in our forearms. Way back (a few million years ago) when we used to maneuver about the trees using our feet, we had to grip with our toes. Gripping or flexing (the “F” of FHL) our toes was the main purpose of the FHL. 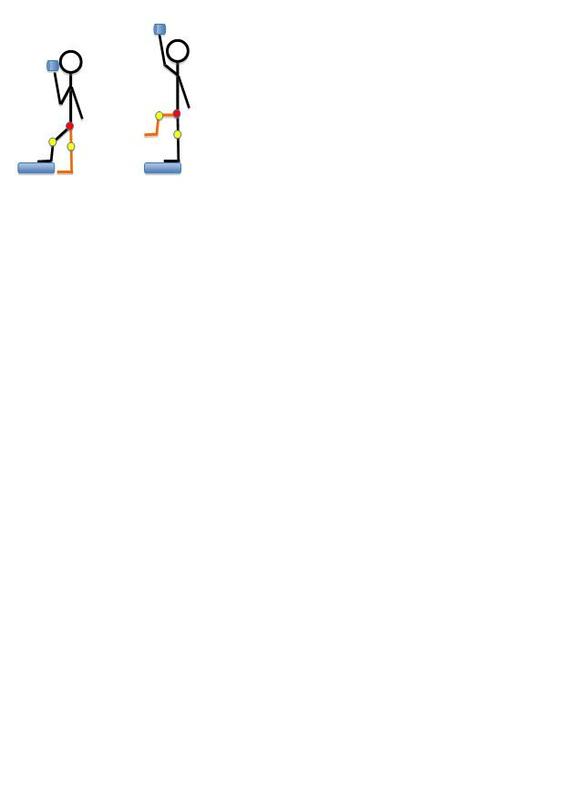 Nowadays, the main function of the FHL is to stabilize our toes and create a stable platform to push off. When this muscle gets strained and overly tight we feel pain in one or more of the following places: the ball of our foot, our arch, near our heel or in the Achilles region of our ankle. It’s rare to feel pain in the muscle itself because the tendon is susceptible to points of high friction in many places. How do you know if you an FHL problem vs. true Achilles tendonitis? How do you fix it? If you’ve been stretching your calf properly and consistently and you still have pain, try the following stretch for a few weeks. 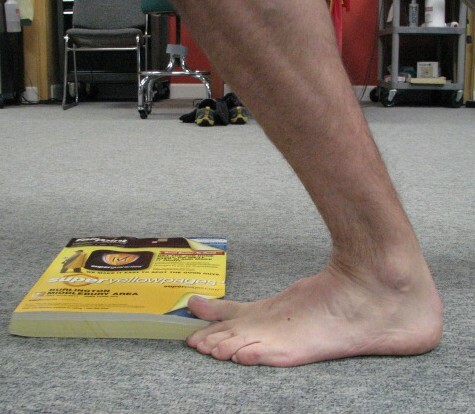 Place a one-inch thick, soft cover book on the floor (a phonebook works well) and stand with just your big toe on the book and the rest of your foot on the floor. Keeping the ball of your foot and heel on the floor, bend your knee forward until you feel a gentle stretch. Hold for 20-30 seconds. Repeat 3-5 times. If this is too painful, open the book half way and try again. As you adapt to the stretch, add more pages. If you start noticing positive changes within a few days then your FHL is likely the problem. It will take several weeks for the pain to resolve completely but you should be running and walking with much more comfort during the recovery phase. The “L” of FHL is for longus. Longus is used to describe a muscle that originates outside the body part it moves. There is also a flexor hallicus brevis that’s located entirely within the foot. I think when most people hear the words “put ice on that” it carries about the same weight as “drive safely”- in one ear out the other. I have many patients with injuries where icing is appropriate. When asked how many times they have iced their injury since I saw them last, they quickly divert their gaze to the floor and uncomfortably begin the report of why they didn’t have time or forgot. I can definitely identify with the lack of time excuse, but if you consider the amount of time put into training, an additional investment of 15-20 minutes is worth it when you consider that one possible alternative is not being able to run at all. This is especially true if the involuntary down time causes you to miss a race that you’ve already paid for. Last week I had to do part of a run on a treadmill. I normally try to avoid treadmills as much as possible but the roads were covered in snow and my training plan had me incorporating some long intervals into my work out. I figured the treadmill would at least provide consistent footing. About 15 min after finishing my workout, I started noticing that the ball of my right foot was becoming more painful. My left calf was also starting to feel irritated as well. Citing the ‘lack of time’ excuse, I didn’t ice these painful areas that day. The next morning when I first stood up I could barely put pressure on my right foot and my left calf was so tight that it was causing heel pain. Throughout that day, I was able to put ice on the ball of my foot a couple of times. The discomfort decreased but never went away. I managed to get through my run for that day without an issue, but by the time I got home a significant amount of pain had returned to the ball of my foot and calf. Instead of trying to put ice packs on all the painful areas I decided to hit everything at once with an ice bath. I filled a 5 gallon bucket about 3/4 full with cold water and stuck my feet in. Once over the initial shock of the cold water from the tap, I started dumping snow (since this is currently an unlimited resource at my house) into the bucket, filling it to the top. Anyone wearing a shoe larger than men’s 10 will not comfortably be able to use a 5 gallon bucket, I could just barely keep my feet flat and the water only covered about 2/3 of my calf. Don’t worry about trying to push the ice/snow down to the bottom, cold water sinks and you’ll quickly feel the colder water hitting your feet. There are several progressive sensations that you should experience with cryotherapy (ice packs included). The first is obviously cold, however adding the ice/snow after your feet are in the water makes this stage much more bearable. The second sensation is going to be an aching/burning type of pain…a moderate ache that’s fairly uncomfortable sets in to the feet first, then the calves. It’s important to remember that you don’t get the full physiologic benefit until after this stage, so try your best to tough it out. After about 10 minutes, this passes as your feet/ankles/calves begin to feel numb. 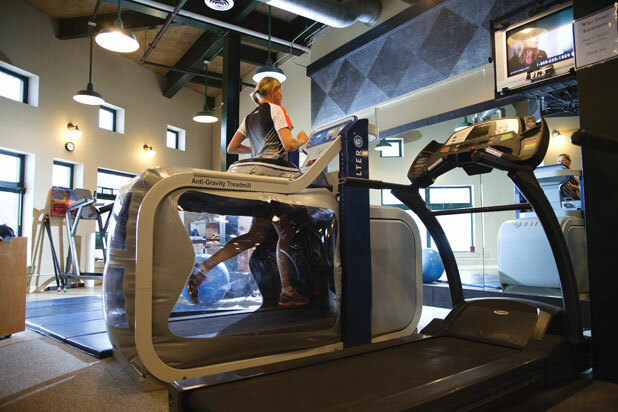 The general recommendation for cryotherapy to reduce pain and swelling is 15-20 minutes. Remember, more is not better, beyond 20 minutes there is the risk of frostbite and there’s an opposite effect of increased blood flow which can worsen the swelling. I make sure I’m in a situation where it’s not necessary for me to walk for another 10-15 minutes after taking my feet out of the water…unless my house was on fire, I don’t think I could anyway. I elevate my feet and let them regain sensation for about 10 minutes and the feeling to them has usually fully returned within 20-30 minutes. The next morning, as I stood up anticipating pain, there was none at all! Not only was the pain gone, as an added bonus my lower legs and feet felt much better overall! Even after my 18 mile run last weekend, the pain in the ball of my foot did not return. However, just for preventative measures I decided to do the ice bath right after I got home. The whole process of soaking my feet/legs in ice water has become easier each time I’ve done it. Small aches and pains can usually be stopped with icing before they become larger problems. If icing doesn’t seem to be helping after several applications, there may be a larger underlying problem, that’s when you may want to have it evaluated by someone.